On 6/12/15 at approx. 1028 hrs. Officers from the Drug Interdiction Unit observed a vehicle in the 1400 block of Central Frwy traveling 81mph in a 60mph speed zone. Officers conducted a traffic stop and the driver of the vehicle appeared to be very nervous. 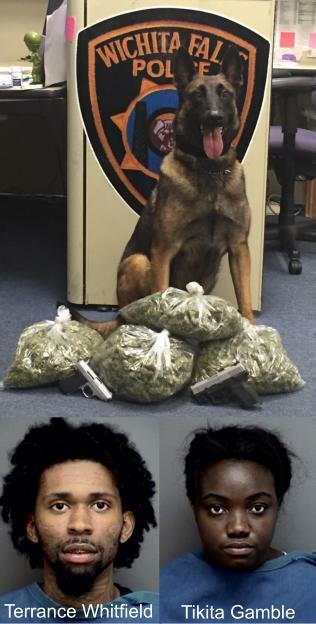 K-9 Officer Kuno alerted on the vehicle and search incident to that alert revealed 3.5 pounds of marijuana and two handguns inside the vehicle. The driver, 22 y/oTerrance Whitfield, and passenger, 23 y/o Tikita Gamble, were both arrested for Possession of Marijuana – State Jail Felony and Unlawful Carrying of A Weapon. The vehicle, a 2009 Lexus, was impounded for possible seizure.